Puerto Vallarta, Mexico (May 2, 2016) - The "Beyond All Inclusive, Beyond All Compare" Velas Resorts announces the opening of Grand Velas Los Cabos on Mexico's Baja Peninsula in November 2016. The $150 million resort is the fifth property of Velas Resorts with over 20 years of tradition in hospitality. The beachfront property will have enhanced signature facilities and services of Grand Velas resorts including duplex wellness suites with juice bars, wine based features inspired by the proximity to the region producing Mexico's fine wines, and dramatic ocean views and unique spaces infusing every area of the resort. A gallery of contemporary art will continue the company's commitment to bringing the art, fashion and culture of Mexico to guests. Grand Velas Los Cabos will offer the next generation of all-inclusive amenities and facilities including a selection of gourmet specialty restaurants, oversize designer suites with plunge pools, a Leading Spa of the World, staff ratio of 3 to 1, exceptional meeting facilities and a commitment to the environment. Located between Cabo San Lucas and San Jose del Cabo, Grand Velas Los Cabos will feature 306 ocean view suites, all over 1,180 sq. ft. with private terraces and personal plunge pools. In addition, five gourmet restaurants with an extensive beverage and wine program; a 16,370 sq. ft. convention center with the capability for 20 breakout rooms; 19,375 sq. ft. spa with 20 treatment rooms and a leading hydrotherapy facility; three pools, including one adults-only; and pool and beach concierges are available. Rounding out the list of amenities and services are a Life Fitness Center with personal trainers, exercise programs, yoga, Pilates and meditation; recreational activities program; separate teens' and kids' club facilities and activities program; 24-hour personalized butler concierge service; and 24-hour insuite service. The curved, half-moon design of the hotel will catch eyes along the corridor with an iconic grand entrance that's open air, three stories high and over 300 ft. above sea level. All of this beachfront, just 35 minutes from the Los Cabos International Airport which directly services over 40 destinations in the United States, Canada and Latin America. Grand Velas Los Cabos' variety of gourmet restaurants, quality of the ingredients, creativity, presentation, and foodie experiences allow guests to explore and savor a worldly fusion of flavors without leaving the comfort of the resort. Food, creativity and presentation comparable to that of top restaurants in world capitals will be served in the resort's signature restaurant, such as Cocina de Autor which will be helmed by a renowned chef. Other on-property fine dining options include Frida, offering Mexican fine dining; Piaf, which serves gourmet French specialties; and Lucca, with a menu of traditional Italian cuisine. For guests seeking a casual dining experience, the all-day dining restaurant Azul offers panoramic beach vistas and a relaxing, open-air, yet air-conditioned, environment in which to indulge in international cuisine. Bistro focuses on fresh seafood. 24-hour In-Suite Dining is also offered. Offering innovative libations and sensory ambiances for every mood, the resort features three diverse bars: Sky Bar, Bistro Bar and Koi Sports Bar and Dancing Lounge. Highlights of the casually elegant space at Koi include a dramatic marble bar, state of the art sound and video equipment and comfortable seating groups. A DJ will spin the latest hits for guests' listening and dancing pleasure with a dedicated dance floor. Stylish suites vary in size from 1,180 to 3,412 sq. ft., while all feature ocean views, private terrace with sitting area and plunge pool, separate living area with sofa, king or two queen beds, expansive bathroom with Jacuzzi and built-in shower. Daily turndown, personal concierge service, daily stocked premium mini-bar with refreshments and snacks, Nespresso Coffee Maker, high definition flat screen with digital cable TV, L'Occitane bath amenities, goose down pillows and comforters, and a pillow menu are also available insuite. A highlight of the suite is the full bottle of artisanal Mezcal, made exclusively for the resort. In the multi-bedroom Governor and Presidential Suites, a bottle of the finest wine from Ensenda also greets guests. Interior design is contemporary Mexican with touches inspired by traditional Mexican architecture, a signature of Grand Velas Resorts. 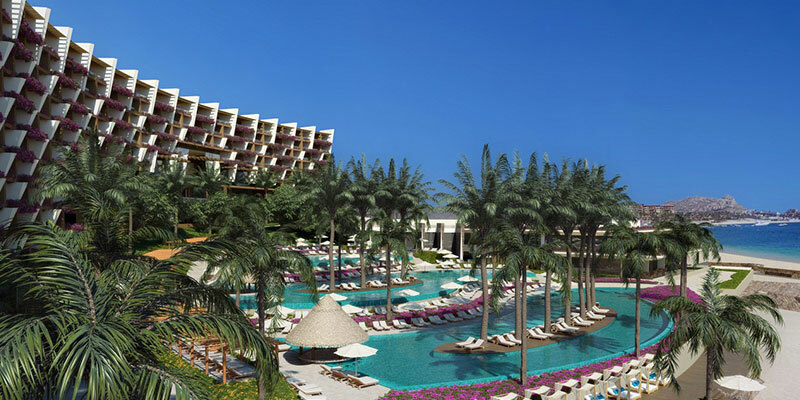 Ricardo Elias, principal of Elias and Elias Architects in Guadalajara, who designed the highly acclaimed Grand Velas Resorts in Riviera Maya and Riviera Nayarit, returned once again to Grand Velas as the architectural designer for the Los Cabos location. The resort's interior design was created by architects Roberto Elias and Ernesto Vela and interior designer Melin Castro. "Our convention center will undoubtedly be one of the largest and most functional of the area that will be able to accommodate a wide variety of top national and international meetings and conventions," said Eduardo Vela Ruiz, owner, founder and president of Velas Resorts. A leisurely day at the resort is effortless with a sun-soaked afternoon walking miles of uninterrupted beach or lounging at one of the three heated pools. The pools' design is inspired by the flora and marine life of the area. An adults-only pool will epitomize Zen and serenity for those looking for total rest and relaxation. All are infinity pools providing maximum views of the Sea of Cortes and its famed whale watching. Grand Velas also offers a collection of workout programs such as yoga and Pilates. For families travelling with children, Grand Velas' Kids' Club offers a safe, fun and creative environment to explore interactive activities such as soccer, treasure hunting and cooking classes. The resort's Teens' Club is a contemporary space where teens from 13-18 years old can enjoy their own mini vacation. The Teens' Club will feature an extensive game room complete with an X-Box Kinect, pool table, air hockey, ping pong, foosball, karaoke set with vintage dance floor and more. Grand Velas Los Cabos has been meticulously designed to exist harmoniously within its fragile environment. To create the site for the resort, several hundred trees and cacti that only grow a centimeter a year were dug up and will be transplanted so all are used, protecting the native flora and fauna of the region. Eliminating the need to rely upon local and regional natural resources, Grand Velas Los Cabos' Reverse-Osmosis Desalting Plants operate self-sufficiently. For every liter of potable water, the resort will be able to re-use 2.54 cups for general purposes, while 1.69 cups are returned to the subsoil, aiding in the conservation of the environment. Saving 30% of all water used in the entire laundry process, the laundry facilities include a water treatment plant that efficiently filters soapy waters to then be used in the rinsing process. The residual water treatment facility receives and processes all the water from the entire resort, which is then used for the watering of all exterior gardens and surrounding mangroves and jungle.